Ever feel swamped with hundreds of campaigns for 2018 when you have not even finished all the projects you set out to do last year? The 12-month marketing calendar you thoroughly prepared worked like magic the first 3 months of the year. And then the ad hoc projects and the must do campaigns took over your calendar. And more demands from the CEO, the sales manager, the partnership director and your international team…so how else can you implement your marketing strategy when you’re bamboozled with conflicting demands from every department in your company? Sure, you can call on your digital marketing team to help with implementation. Or you can tap into some external expertise for new and fresh ideas…. How can you double the leads (or get a steady stream of leads) while reducing the cost of acquiring those leads and still be the favourite among your clients and potential clients? Here are the top 3 tools you must use to generate more leads. You’d think these marketing challenges are all too much and overwhelming, but it need not be. You just have to be strategic…. In his best-selling book The Ultimate Sales Machine, the late author and corporate trainer Chet Holmes, outlined 12 strategies that he successfully implemented for his clients including many Fortune 500 companies. And while the book’s title may give the idea that it is all about sales, don’t be misled. It must be one of the best books on business strategies. If followed and implemented with a ‘pigheaded discipline and determination’, that Holmes recommended, the strategies can definitely improve every company’s marketing and sales results. It is teeming with actual examples of how companies have successfully grown their business by implementing Holmes’ strategies. Manage you time effectively and efficiently by getting more organised and less reactive. Cut out distractions during your working day and focus only a few high-impact activities rather than hundreds of mundane tasks. In this fast paced and competitive environment, you need to be constantly learning. Most professions including doctors, lawyers, accountants, financial planners and healthcare providers have mandatory training and continuing education. As a marketer, you also need to keep up and be on top of new trends, new tools, new ways of communicating with your customers. Training can raise the standard of your marketing efforts. It can also deliver more money by making you and your team more efficient in your role. Take advantage of online courses, attend marketing specific seminars, workshops and conferences. Join relevant groups where you can pick up and exchange ideas with different people. Take advantage of online courses, attend marketing specific seminars, workshops and conferences. Join relevant groups where you can pick up and exchange ideas with different people. Use workshop-style meetings to improve every aspect of your marketing. Focus on fixing one small part of your marketing first before moving on to another item. Holmes recommends the ‘3 Ps’ –planning, procedures and policies – if you want to quickly grow and reap fantastic results for your marketing efforts. Decline any meeting where all you have to do is listen to other people report on what’s happening this week. Instead, every meeting should have defined agenda, clear objectives, results or action items that all attendees can contribute to. Nowadays, it’s getting harder to get in front of potential buyers, or even just to get their attention. So you need to maximise every opportunity to connect and communicate with your customers when you get the chance. Instead of always going for short-term results, focus on delivering value, building solid relationships, building rapport and becoming the source of valued and useful information. Use education-based marketing to create opportunities to educate prospective clients. Educate your clients and you can convert them into loyal and long-term supporters rather than just one time buyers. Having top quality and only the best people in your marketing team is essential. In this highly competitive environment, you need marketing people who always take the initiative, are eager to please, always looking for more to do, always wanting more responsibility and always wanting to know more than you think they need to know. These are the type of people who can help you achieve and deliver great marketing results. We all know the saying, hire an average person and you will get average results. But if you hire top quality performers, you can generate top quality results. Despite the thousands of potential customers, there’s only a small number of ‘best customers’. This means if you focus your marketing efforts to reach a small number of those ‘best customers’ you will most likely get better results than marketing to numerous clients or ‘all clients’. Based on his experience consulting for companies in various industries, Holmes said the ‘best customers’ buy more, buy faster and buy more often than other customers. Therefore, it pays to focus and spend more efforts and dedicate more of your marketing resources in getting those ‘best customers’. Considering the millions of projects that you and your marketing team have to deliver to the business on an ongoing basis, it is very easy to jump from one item to another. Often there’s very little time and effort to even consider how the different areas of marketing can be optimised. For example, when you create an email campaign to reactivate dormant clients, do you consult the sales team to ask them what type of questions and concerns do they get from existing clients? By getting the input from the sales team or those who deal directly with clients, you can tailor your email to address the relevant issues raised by clients. Another way of optimising your marketing efforts is through content marketing. When you create top quality and highly informative content, try to find different ways of presenting it in various channels. Consider the following social media stats. Twitter – 2,800,000 Active Australian Users approx. Even if you only try to re-use a single piece of content in at least 3-5 channels instead of one, you can significantly boost the results of your marketing strategy. In this age of digital technology, many people are getting used to and actually preferring more visual communication. No wonder YouTube, Instagram, Snapchat and other visual and video-based channels are rising in popularity. There are also many scientifically proven tests that showed we humans remember and retain more information based on what we both hear and see. And by using illustrations, pictures, graphs, charts and other images, you can present complex ideas in simple and easy to understand manner. It’s been often said that there is no shortage of (good) ideas, the problem is in implementing them. And this is exactly what’s happening in most marketing teams. Even if you only get 2-3 ideas from each person in your team per month, you could have 6-9 ideas in no time. But the challenge is when will you have the time to implement those ideas. And this is where discipline and what Holmes called ‘pig-headed determination’ to deliver and follow through on your marketing strategies. Once you have planned and put the processes in place, you need to dedicate the time and effort on an ongoing basis, not just for a week or so. As a consistent top performer and training coach, Holmes had developed and documented sales and marketing processes that delivered outstanding results. There is no doubt of the fact that it is doubly expensive to get a new client than to retain an existing one. This means that when you have finally signed up a new client, there must be a consistent effort to keep that client happy and doing business with you for the long haul. Instead of just selling to the client at every opportunity, your marketing efforts must provide value to your clients. For example, you can run a series of webinars, seminars or exclusive workshops for your clients. Some companies use influencers – some high-profile industry personalities and experts – to give clients an exclusive experience they can’t get anywhere else. 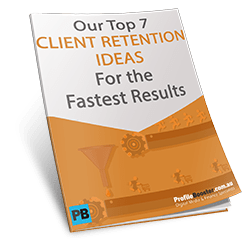 If you want more ideas on how to retain your existing clients, check our previous post about this important topic. Reviewing your marketing results on a regular monthly or quarterly basis is important at least for two reasons. One is that it will give you an objective view of what worked and what didn’t work. The second is that it will help you prioritise projects and activities that will deliver more and better results. For example, if you run 2-3 social media advertising campaigns in a month, by the end of the month you can review and measure the performance of each. Then you can decide on which one to continue and which one to cut. Though most social media channels provide daily or even real-time reports and statistics, it is better to have a longer time frame to see some relevant trends among your marketing campaigns. And by reviewing the results over a period of time, you can use marketing automation strategies to create relevant content and materials that will speak to your clients and potential clients. And yes, though it may seem overwhelming and too much to handle at times, you can be more strategic with your marketing efforts by focusing on a few high-impact areas. If you have any question on how to implement any of these strategies, contact us and we’ll be happy to help.